The owner of the ruptured pipeline that spilled thousands of gallons of oil along the coastline of Refugio State Beach near Santa Barbara has accumulated 175 safety and maintenance infractions since 2006. SANTA BARBARA, Calif. (KABC) -- The owner of the ruptured pipeline that spilled thousands of gallons of oil along the coastline of Refugio State Beach near Santa Barbara has accumulated 175 safety and maintenance infractions since 2006, ranking among the top five of companies with the most violations in the U.S.
Plains All-American Pipeline has caused nearly $24 million in property damage between 2006 and 2015. It was also fined $115,600 for two cases in 2009. A fine for an incident in 2013 for $103,400 was also pending, according to the Pipeline and Hazardous Materials Safety Administration. The Santa Maria-based company owns nearly 6,500 miles of pipeline and is the 17th largest owner in miles of pipeline in the U.S.
On Tuesday, the company's 24-inch pipe ruptured, spilling about 105,000 gallons of oil onto the beach and an estimated 21,000 gallons of oil into the ocean. Officials for Plains All-American Pipeline said it was not operating at full capacity at the time, but that 500 barrels of oil may have leaked before the pipeline was secured. The company says it's taking full responsibility. "Our focus does remain committed to doing the right thing. We're not going away, we're going to be here till it's returned back to the way it was," said Patrick Hodgkins of Plains All-American Pipeline. 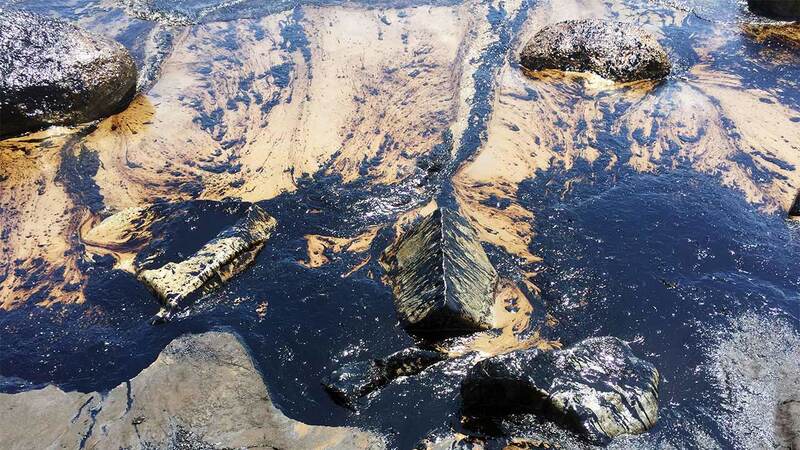 About 7,700 gallons of oil has been removed, a fraction of the amount initially estimated, as the oil slick stretched across 9 miles of coastline. Gov. Jerry Brown issued an emergency proclamation Wednesday to free up state funding and resources for the clean-up. Three hundred first responders and environmental contractors remained on scene to continue removing oil and picking up oil-covered seaweed and sand. More than 3,000 feet of boom has been deployed to surround the slick in the ocean. No evidence of widespread harm to birds and sea life are expected, but five oiled pelicans were taken to San Pedro for care, officials said. A number of dead animals, including lobster and fish, were also found. "There have been a number of dead animals recovered and these include lobsters, kelp bass, which is a marine fish, and other marine invertebrates in the area," said Mark Crossland, a captain with the California Department of Fish and Wildlife. "It has not really gone much further south and it is going offshore, and it's spreading out which will make it a little bit more difficult to collect," U.S. Coast Guard Capt. Jennifer Williams said at a news conference Thursday. Clean-up efforts were expected to take months. Refugio and El Capitan state beaches were closed until further notice. For individuals who wish to volunteer in the clean-up effort, visit calspillwatch.com for more information. A ruptured pipeline spilled oil at Refugio State Beach, 20 miles west of Santa Barbara on Tuesday, May 19, 2015.